An important high-level scientific convention took piace at the Lyeeum club in Catania on the transfer of man towards the heavens. It was a eultural initiative undertahen by the president N.I. 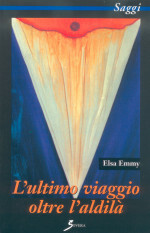 Concetta Abatelli Trigona in occasion of the last Elsa Emmy's volume, entitled The Last Departure", a wellknown woman writer who affirms of having spiritual contatta with the world of dead and, espeeially with her mother, for whom the author had always had an everlasting love. The "tandem" Trantino-Sciacca, great supporters of the modem thought (deepiy interested in historieal and philosophical subjeets addressed to the human trans-communication or to unknown worlds), has brilliantiy analysed on different levels the book's content along with the famous essayist, Mrs. Elsa Emmya, who going into the worth of the Last Departure's expressive values, has sustained that the book is the very female behaviour tendini to make anse cunosity as well as emotion related to feelings and to memones that are the basis of the strongest love of ali. Affirming sueh thoughts, she allo reminded another great literature's author, Dostoevskij, who was neve, able to realize what, lies behind the existential human doubts, and, in front of the universal meaning of love he remained perplexed and silent. The psyehology of the mystery had defeated him. Large crowd took part at the meeting attracted by the unusual theme, which has enormously eontributed to make acknowledge a matter, which is placed between the theosophy (the Passionist father Trummolo argued it) and much next to a hypothetical, esotenc and metaphysics vision of our daily life.